The Anxious Brain - Description | W. W. Norton & Company Ltd.
Therapists and their clients benefit from understanding how anxiety is generated in the brain, how it can become panic or unbounded worry, and ultimately how the brain re-establishes the neurochemical balance that is basic to a state of well-being. These insights in the brain underlying mental phenomena put anxiety into a perspective that makes it easier to become calm, and provides the bases for effective intervention with thought exercises, breathing techniques, and behavioral adaptations. 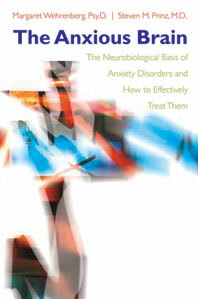 The Anxious Brain is a timely clinical guide. Current statistics show that up to one-third of Americans suffers a panic attack during their lifetime and up to eight percent is currently suffering from one of the anxiety disorders. Medication, once considered the first line of treatment, is losing public favor as clients realize their symptoms re-emerge when they stop using the drugs. However, our increasing understanding of the brain offers clinicians and clients a new and expanding set of resources that include but go well beyond pharmacological treatments. Wehrenberg and Prinz describe brain structure and function and neurotransmitter activity related to the three major anxiety disorders in a way that psychotherapists can better understand, diagnose, and effectively treat anxiety disorders. Rich in neurophysiological diagrams and practical exercises that target the activity of specific neurological mechanisms, this book shows us how to take control of our brains to alleviate various anxiety disorders. A much-anticipated update to the classic personal road map, full of strategies to understand, manage and conquer your stress. The newly updated workbook companion for putting the top anxiety management techniques into practice. Updated editions of the best-selling books on how to understand, manage, and conquer your anxiety. Ready-to-use strategies to tame even your most anxiety-inducing moments.